A new major exhibition of paintings by Howard Hodgkin explores the acclaimed British artist’s use of abstraction as an expression of subjective experience. Spanning ten years of the artist’s career, the exhibition will include paintings not previously seen by a broader public, including a powerful body of new work developing out of his Home, Home on the Range series of 2008. Home, Home on the Range, 2001 - 2007 © Howard Hodgkin, Gagosian Gallery. Together, they will highlight the physical as well as emotional charge of Hodgkin’s art through his use of scale, sensitivity to light and his ability to create painterly equivalents of depth and atmosphere using colour and brushstroke. Here is The Guardian's review by Jonathan Jones which gets the point but curiously references Rauschenberg as a connection. Rauschenberg was a major innovator which I suppose is a link to Cezanne but in touch and flavour very different. In my eyes Rauschenberg was certainly not a romantic in the manner of Hodgkin but you takes your flowers and chocolates were you find them Jonathan. 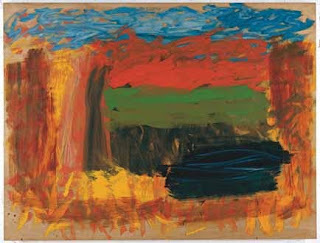 I don't understand why & how is it that Howard Hodgkin is so good.